Solihull Council looks set to object to controversial plans by Tudor Grange Academy to alter the school’s admissions policy. The proposals would give preference to pupils at two CofE primaries - St James’, in Shirley, and St Alphege Juniors. A report prepared by the borough council, to be considered by education chiefs on Monday, argued the existing arrangements have worked successfully for years. The local authority concedes that even by giving priority to the two faith schools, Tudor Grange should still be able to accommodate children in the catchment area until at least 2019. But the report said that in the longer term, there could be a risk that families living in areas such as Hockley Heath, Monkspath and Tidbury Green, and those with older siblings at the school, could be denied a place by the change in policy. “The council is concerned that this could destabilise the present arrangements, and could ultimately result in some children in the future being unable to secure a place in a local school,” said Chris Palmer, director of children’s services. Fears have also been raised that the policy could set a precedent, with other schools outside local authority control choosing to move away from the principle of priority for those in the catchment area. The issue was discussed at this week’s Full Council meeting, with Coun Claire O’Kane (Lib Dem, Olton) voicing concern that the admissions system risked “religious discrimination”. Solihull Council’s education chief, Coun Joe Tildesley, said this would not be the case, as discriminating on grounds of faith would be illegal. 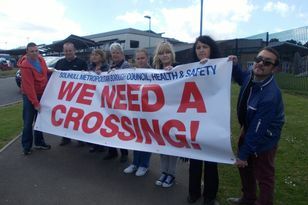 But the cabinet member did say he had concerns about the impact the policy could have locally. Solihull MP Lorely Burt said she was looking into parents’ concerns, saying she would seek answers from the school. FURIOUS Solihull parents have hit out at the top performing Tudor Grange Academy after it announced proposals to give priority places to pupils from two faith junior schools.